We use the latest dental technology available to make your experience easier, safer and better than ever before. We even have a board-certified Pediatric Specialist on our staff in order to deliver your children with the best possible dental treatments and procedures. We provide an environmentally-friendly paperless office and offer chair-side computers to improve the quality and comfort of your visits. We also utilize Under-Armour Performance mouthwear in order to help create a relaxing and worry-free dental atmosphere. Get In Touch With Our Wilmington Team Today! 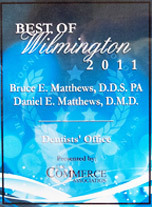 Contact Dr. Bruce Matthews in our Wilmington office at (302) 475-9220 to schedule an appointment. Our office was featured on Delaware Today! Read the article here. 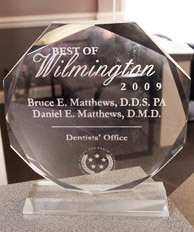 A Wilmington Dentist winner of the 2015 Patients' Choice Awards.